These needles are a kind of DPN (double pointed needle) and circular needle hybrid, the set consists of three 'hinged' double pointed needles. Each needle has a sharp and blunter tip. I usually knit socks using the magic loop technique, I use an 80cm circular needle. I don't love knitting with DPNs, I find it easier to get a ladder between needles, the tips of the needles get caught in the cuffs of whatever I'm wearing and I lose the loose needle every time I put the sock down. The Crasy Trio seems to solve the ladder issue, the caught in the cuff issue seems reduced and the losing the third needle is still a problem. It took me a while (maybe 10 rounds) to get used to these needles and work out the best way for me to hold them but once I did, I liked them. A lot. The advantage of these needles over standard DPNs is the stitches of your sock (or other item worked in the round) are divided over two needles, you use the third needle to knit with. Because there are one, or more likely, two less needle transitions, knitting with these should be faster and smoother than traditional DPNs. The joins between the needle tips and the short cable are all pristine - I have always found Addi needles to be very high quality. The one blunt, one pointed needle tip is a nice feature. 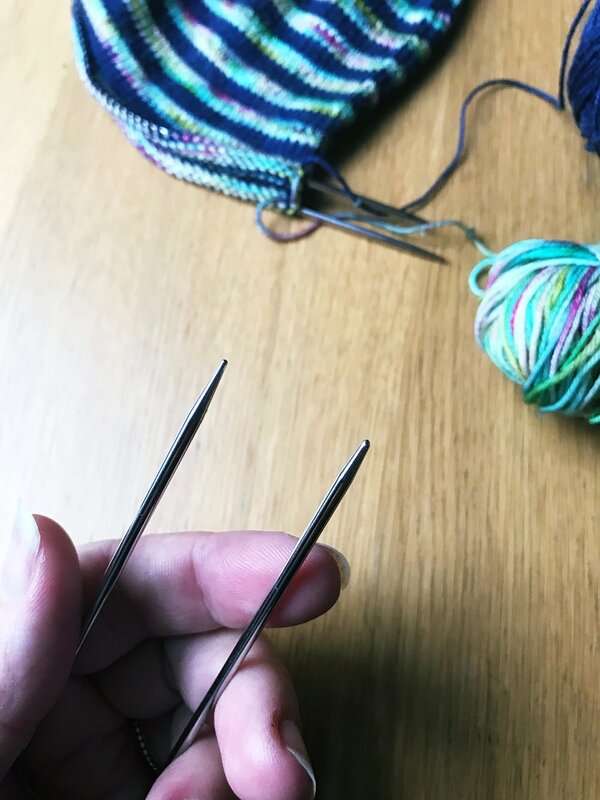 I like my needles sharp but I know a lot of people who prefer blunt needles, it would take a bit of extra time to make sure you deliberately knit with one end or the other but having the option is great. These needles cost £14-15, that is a lot more than other needle sets but really they are 3 separate (very short) circular needles so I can understand the price point. I have ordered another set in a different needle tip size so I think they are worth the investment. Overall, I really like these needles. They are innovative and well thought out, I would recommend them to anyone looking for new DPNs or looking to try something a bit different. 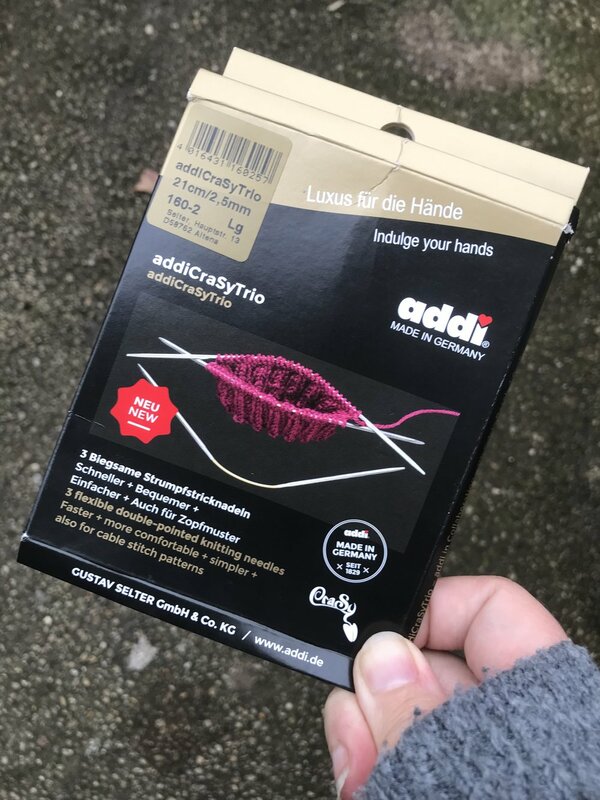 I bought these needles with my own money and I am not affiliated with Addi in any way. The yarn is Socks Yeah! in Benitoite and a mini skein from Vicki Brown Designs.